Whenever I make a new hiring in my company, I always ask a hypothetical question! I am sure even you must have experienced a situation where you have to give an answer to a really tricky hypothetical question. But one common thing I found in most of the candidates is that they fail to answer such questions properly. And this is something that brings them to rejection. If you too are among those who fail to properly answer a hypothetical question, then this post has very important stuff for you. 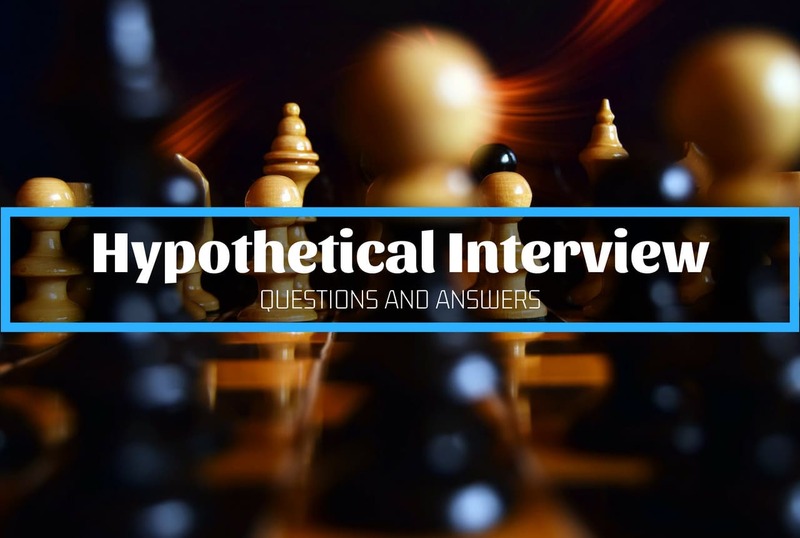 What is a Hypothetical Interview? Hypothetical interviews are the type of interviews in which the interviewer puts you in an imaginary and experimental situation and assess how you handle that situation. It is something similar to role play. Asking these type of questions helps the employer to evaluate your analytical and people skills. The tips involved in answering hypothetical interview questions works the same as it works for problem solving questions. Gather all the information related to the issue. Implement the proposed solution effectively. Read on to know everything about hypothetical interview questions! What are Hypothetical Interview Questions? Before I dig down every minute detail about such questions, it is first essential to have a clear idea of its meaning. Like behavioral interview questions, your interviewer would ask you hypothetical questions based on a specific situation. Being a candidate, you have to assess the situation and offer solutions on how you will or have handled it. In most of the cases, situation based questions involve handling difficult issues, managing issues at the workplace, and problem-solving. If you have met such a situation earlier then you can always share the details about the same, like how you anticipate responding to the situation. By this way you are offering the interviewer with a solid piece of information on how you will handle the situation. Why are Hypothetical Interview Questions Important? Being an interviewer, I ask hypothetical interview questions because it allows me to find out the best answers and ways an interviewee would adapt to deal with an unexpected situation. It is because such situations can always occur at work tenure. With such questions, I am able to gauge an overall view of a candidate’s ability and potential to fit in the company’s culture. The aim is to analyse the problem-solving and spontaneity of the candidate. Besides this, there are lots more that make hypothetical interview questions important for the interview. A candidate can answer such questions in the best way only if he speaks honestly. So, when employers want to make out that the candidate is being honest or lying to them then asking such questions is the best way out. Even the candidate showcases his personal commitment towards the company while answering such a question. Asking such questions help hiring managers to identify whether one can efficiently accept suggestions and instructions from the reporting managers or not. These are probing questions that intend to judge the respectful attitude of the candidate towards the company in an unexpected situation such as a conflict with the immediate boss or an issue with the manager or a problem with the colleague. While answering such questions, you must keep your ego and attitude aside. Make sure you showcase a respectful attitude towards the company. Another important reason to ask such questions is that it allows recruiting experts to evaluate the leadership skills of a candidate. Situations such as regular conflicts at the workplace or inability to complete a project or failure to meet a deadline as a team can happen with anyone. Convincing the interviewer that you would be individually able to resolve the problem and would contribute to all sorts of downfall will highlight your discipline and problem-solving ability. Hypothetical questions are the best tool for a hiring manager to identify the decision-making skills of a candidate. You may fall into various types of situations at work. Some can be tough while other can be toughest to handle! So, how would you react in such a situation? What decision will you take? How will you be able to work in favor of the company? These and answers to more such questions can be identified only when the interviewer puts up such questions. Hence, to know about your decision-making skills during an unexpected situation your interviewer may put up such questions to you. Sometimes you may fall in a situation where your customer is annoyed with you. A tricky demand can make the situation worse. But to ensure that your customer’s interest is not hampered you have to make a wise decision. With a hypothetical question, you will be able to highlight your personal commitment and dedication to offer excellent customer support. Because no matter to which industry you work and which position you hold, speedy resolution with the customers is what that every company expects and wants. How to Answer the Hypothetical Questions? Whenever such a hypothetical interview question is asked in an interview, most of the candidates gets confused and experience anxiety. That mostly leads them to break their confidence and avoid them to pass the interview. Hypothetical questions are mostly chaotic, so to answer such questions you need to think in all the angles possible. The interviewer main intention of asking this question is to check your problem solving and thinking skills. If you at any point come across such questions then don’t panic, here we will be disusing few steps through which you can answer such questions without much effort easily. Speak confidently overcoming the nervousness to answer the question. Surely the hypothetical questions are problematic to answer. The most common hypothetical question asked in an interview are “what would you do, if ” followed by an imaginary or critical situation. We sometime straight away get an answer to the solution , but we resists ourselves saying that answer. Instead we prepare a virtual kind of solution to the question which could impress the interviewer. Most of the time the solution for hypothetical questions are idealized. In simple terms not possible or far away from the read world. Understand a simple thing that , our hypothetical selves and real selves are totally different. The another problem with hypothetical question is that, it is too easy to give fake answers. You already know what kind of answer should be given to impress the interviewer or what answer is the interviewer expecting. Though the hypothetical questions asked in a interview are chaotic to some extend. The interviewers uses these questions to asses few traits of the candidate. Are you able to take your own decisions? How good are you in decision making? Do others dictate your decisions? Can you work independently or do you need constant support? How far can you go to boost your career? A secure ‘pay’ or a challenging career, what is important for you? Can you remain composed and work under pressure? How do you deal with unanticipated situations? Can you independently deal with the day-to-day unique business complexities? You must try to answer hypothetical questions in a way that highlight your strengths and qualities. Your answers must portray a good success story and must showcase how your skills have helped to overcome a problem. I will share with you answers to some common hypothetical interview questions so that you have a better idea answering them! Describe a situation where you need to collaborate with a difficult colleague? While answering this question you need to demonstrate a professional attitude and seamless communication. This question will test your conflict-resolution and problem-solving skills. You will be considered a good candidate only when you are able to work with others. It is essential to achieve a lucrative outcome and combat coworker related issues. If you will blame others for an issue then you will be considered as an unsuitable candidate. Describe a situation where you need to work with a difficult manager or difficult customer? Answering this question will reveal the behavior of candidate towards communication, problem-solving, and authority. Make sure you don’t include personal behavior or disagreements to make your way to the company. A good candidate is one that demonstrates professionalism and emotional maturity. Describe any difficult situation at work and how you resolved it? Approaching efficiently any unexpected problem can be tested with this answer. The interviewer would ask this question to test your collaborative skill. In addition to this, it would also test the possible solutions and their implementation in a situation. Describe a situation when you need to convince others to change their decision? With this situational question, the candidate would want to explore your soft skills, like relationship building and communication. You need to demonstrate listening skills and empathy so that the interviewer is able to understand your power to influence others and change their opinion. You need to explore your negotiation and convincing skills. Describe a situation when you made a mistake professionally? We all are human and must be able to admit that we have made mistakes. This hypothetical question will test how you have learned from your past mistakes and how you will implement them in the future. If you refuse to admit that you made any past mistake then this is a sign that you are either lying or overconfident, which makes you an unfit candidate for any organization. Describe a stance when you were criticized? This question illustrates the ability of the candidate to learn. Make sure you take a decision only after analyzing it properly. If you are a good candidate then you will never take criticism personally. You need to present emotional maturity, leadership potential, and adaptability. Describe a situation where you worked under strict deadline? If the interviewer puts up this question then you need to demonstrate your success story. You need to organize your work flow, deal with pressure and check for your priorities. It is an excellent opportunity to hear the planning process of the candidate and the way you can communicate it to others. Also, the interviewer would want to know that did you extend the deadline or ask for additional help or fully commit the deadline. Describe a situation when you require taking an initiative? This answer will show your pro activity. In this case, you must be recognized as someone who attempted to resolve the problem and took initiative to solve the issue. Your answer must represent clearly that you are willing to go above and beyond the call when needed. Problem-solving and pro activity are the traits that would be tested with this question. Describe a situation where you needed to resolve customer problem without any support? This question attempts to check candidates on how adaptable they are while interacting with other personalities. It tries to explore the potential of candidates to communicate and convince people with distinct nature. This question evaluates intelligence, people, and emotional skills. Describe a situation when you worked with a new team? The interviewer would ask this question to know how well a candidate adapts to changes especially when they are working with new people. This situation is applicable to all new hires and hence the interviewer would want to test that the new hires are adaptable to changes or not. It is essential for a new candidate to not judge people or processes without knowing all the facts. You can answer a hypothetical question well only when you are ready to deliver a two-fold answer. First is to understand what is expected from your answer. Second is to anticipate the question and prepare more than one solution to a situation. This will make interviewer consider you successful in the role. Once you are confident enough that what you have prepared is apt to the situation, it is time to visualize it. Visualize yourself in the situation and implementing the prepared solution. Now check that, will it really work or will it fail to deliver adequate results. Do research about the company to prepare an answer that is in line with their needs. When this question is portrayed, then the interviewer wants to know how well you are aware of the company’s culture. Learn much about the company through links, company’s website, and social networking sites. Hypothetical questions intend to probe well-composed answers. These questions are designed to measure complexity, scope, and behavioral changes within the answers. Hence, you must prepare more than one response to a question. The STAR format stands for Situation, Task, Action, and Results format. It is the best way to frame appropriate answers to the most common interview questions. It is essential that your answers showcase clear results. Avoid spending too much time on situation and task. Instead, make sure that you deliver adequate results and solutions. Hypothetical questions intend to test your problem-solving skills as well as thinking procedures. Hence, make sure that you deliver an answer slowly and be confirmed about each and every word spoken. Before you begin answering the question make sure you are absolutely clear about what has been asked. If there is any confusion then do clarify it. Such questions are asked to know about your communication successes, problem-solving, or other challenges that you have faced. If you have any confusion while answering the question then it is best to get it clarified and then deliver an answer. Most often job seekers rehearse an answer before they go for an interview. As a result, they may experience delivering a rehearsed response. Interviewers would like to retain content that is engaging and easy to relate. Hence, avoid preparing rehearsed answers. Rather, look out for convincing, engaging, and honest stories. Just like behavioral questions even hypothetical questions can come up in different ways. So, prepare yourself well. Listen first then frame an answer and then deliver it in a confident way.